Hi friends! It’s been awhile since I’ve written a blog post. I am so excited to be back in the groove and start writing again! Thank you for following me on this journey! First, I want to say that this post is in no way sponsored. 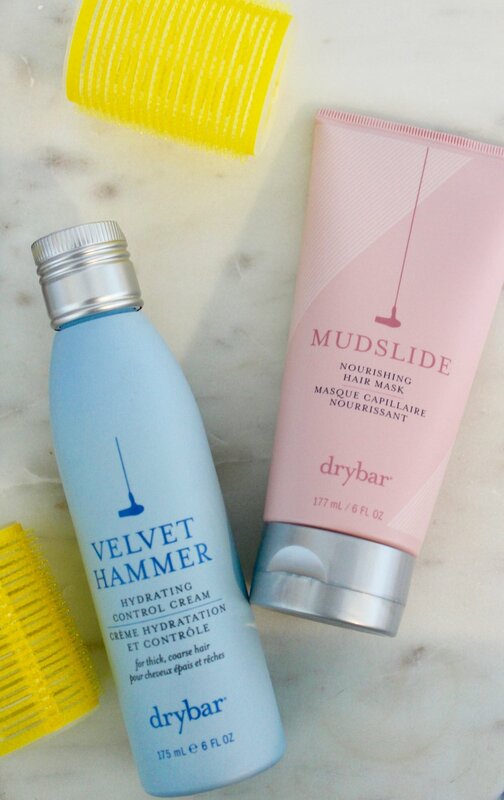 I just really LOVE Drybar products and want to share them with y’all! I truly believe in this brand and have seen a difference in my hair since using their products. I started using Drybar about 2 years ago. 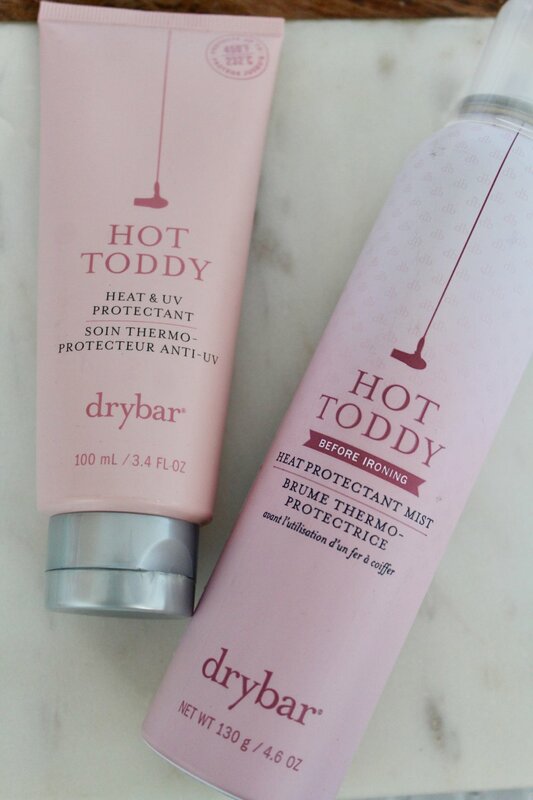 I picked up some of their products at Ulta and was instantly hooked! The first thing I noticed was how amazing their products smell. If you haven’t smelled their products, I’m not sure the best way to describe it — other than a party for your nose! LOL. The second thing I noticed was how much my hair loved the products. My hair is pretty picky, and rejects a lot of products. It’s a good day when I find a product/brand that works for me. Lastly, I loved the image of Drybar. Their products are colorful, have fun names and are inviting to use! 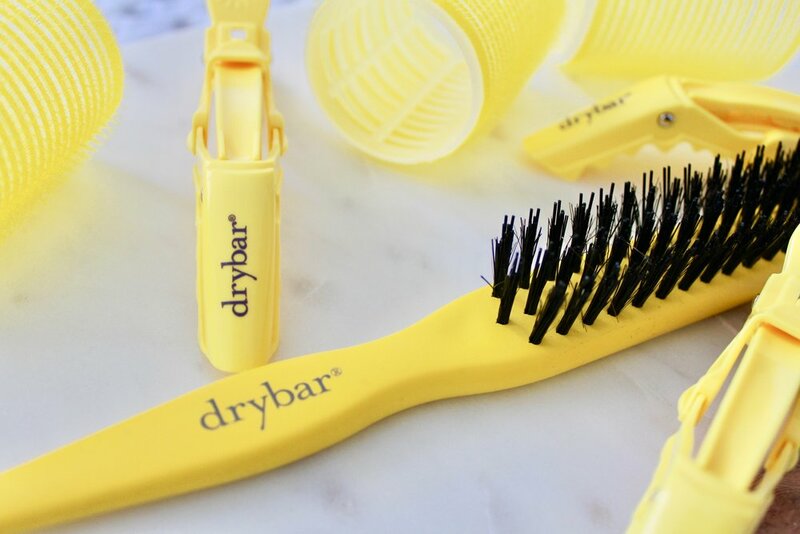 I love Drybar accessories almost as much as I love their haircare products. I use their ‘Hold Me’ clips every time I do my hair. I use them to section off my hair when curling and straightening. I also really love their ‘Texas Tease’ brush. I’m from the south, so volumized hair is a must. When I’m curling my hair I use the ‘High Tops’ rollers. I’m still getting the hang of using rollers, but I do see more bounce and volume when I use them. Also, (not pictured) I use the Drybar “Lemon Drop’ brush. It’s similar to the Wetbrush. It’s perfect for detangling my hair after a shower. Lastly, (not pictured) I use the ‘Morning After’ shower cap. I don’t wash my hair everyday so a nice shower cap is imperative for me! What I really love about this shower cap is how powerful the elastic band is. Also, I love that the inside of the cap is made out of towel-like terrycloth. It keeps my hair dry and holds it all comfortably inside the cap. I started using ‘Blonde Ale’ shampoo and ‘Blonde Ale’ conditioner after dyeing my hair blonde. I heard how great purple shampoos were for keeping blonde “icy” and “ashy”. 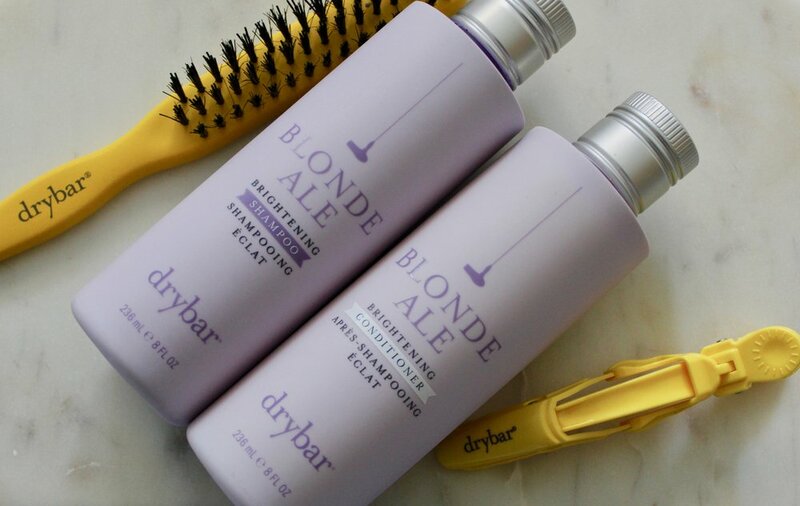 When I saw that Drybar made a purple shampoo + conditioner, I was sold. I already had such confidence in their other products. No surprise, but this shampoo + conditioner smell amazing, and they really do help keep my hair bright and blonde. This shampoo + conditioner also help any brassy tones that try and make their way into my look. Ahh, my trusty dry shampoo and texturizing spray!!! For dry shampoo, I switch back and forth between the ‘Detox Whipped’ and the regular ‘Detox’. As I mentioned before, I don’t wash my hair daily so dry shampoo is what get’s me through. My trick for dry shampoo is to put it in my hair before bed, and then put my hair up in a pony tail. I let the dry shampoo “marinate” if you will. When I wake up in the morning there’s no powder left and my hair looks fresh! I use ‘Triple Sec’ after curling my hair to add volume and texture. Also, it smells so incredible, it’s almost like perfume for your hair! 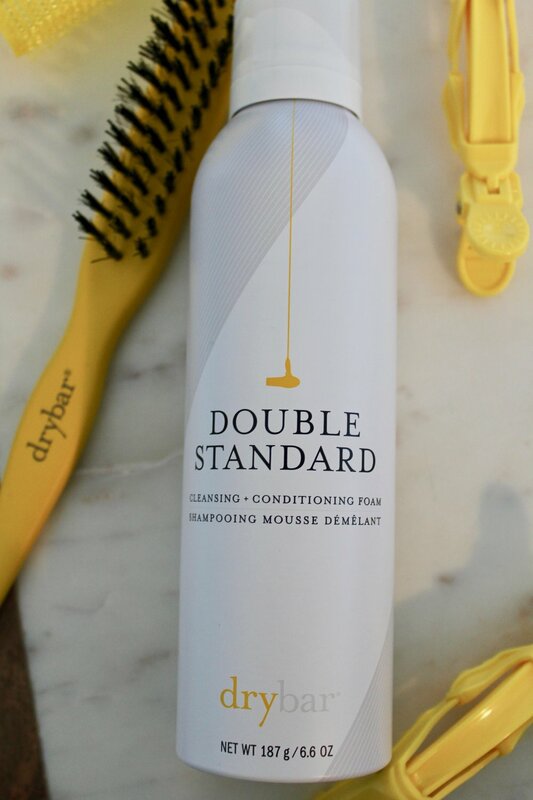 The ‘Double Standard’ is one of my newest Drybar products. I’ve only used it a couple of times, and I’m loving it so far. It’s a shampoo + conditioner in one. You use it in the shower and it smells great, of course! I’m usually not the biggest fan of “2 in 1” cleaners/conditioners but this one is really great. I’m probably going to save it for when I travel. Instead of packing a shampoo and conditioner, I’ll just pack this bad boy! For the days when I don’t want to use heat on my hair, I use this! I love the ‘Mai Tai Spritzer’ because it smells amazing, and it also really helps give my "beach waves” some definition. I never want my hair to look crunchy, I always want beachy mermaid hair. This product gives me that! Awww, the ‘Southern Belle’ I LOVE this product! My mama originally turned me on to this product, and now I can’t imagine blow drying my hair without it! This product 1000000% adds volume to my hair. I add it to my roots when my hair is wet, before I blow it dry. What a pair!! These two products are life changing, truly. I use ‘Mr. Incredible’ when my hair is wet, before I blow it dry. I concentrate this product to mostly my ends. Since my hair is dyed, it gets pretty dry. I’m constantly trying products to help my poor ends. I use ‘100 Proof’ when my hair is dry. I use this as a finishing touch to my styled hair. Like the Mr. Incredible, I focus this product on my ends. This product is reaaaaalllly thick, so a little goes a long way! I use these two products as a treatment for my hair about once a week. I use ‘Velvet Hammer’ as a leave in conditioner. It's super hydrating and leaves my ends feeling quenched. I use the ‘Mudslide’ mask and leave it on for as long as I can before rinsing it out. It really does help my hair feel and look better. I’m really hard on my hair, so these products help heal the damage I do. Last but not least, my beloved ‘Prep Rally’!!!!! 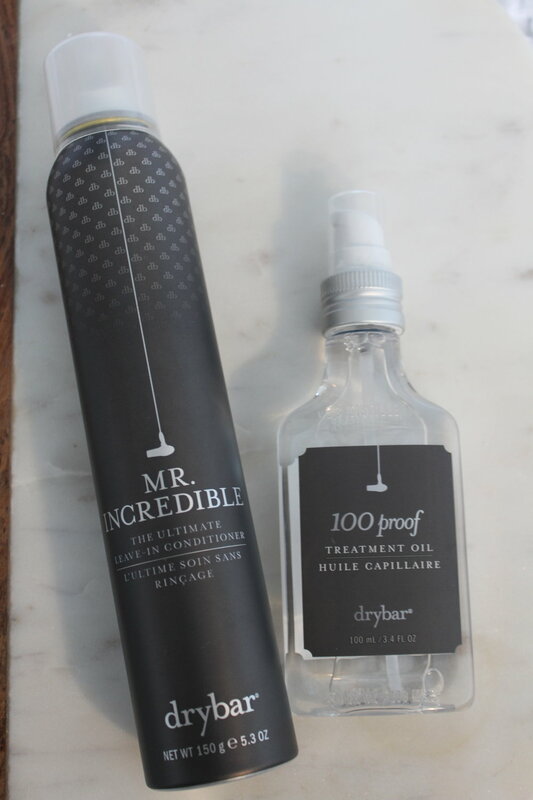 This was my first ever Drybar product…and now look where I am! LOL. This stuff is great!!! I use this after towel drying my hair, BEFORE I brush it out. This makes my brush glide through my hair like butter! I have also used this after getting off the boat, when my hair was a literal birds nest. I was so scared I was possibly going to have to cut the knot out of my hair. My trusted Prep Rally helped me through it. I’ve turned my mama and my friends on to this amazing product! Thank you for reading along and for supporting me on this blogging adventure!